Regular followers of RealClimate will be aware of our publication in 2009 in Nature, showing that West Antarctica — the part of the Antarctic ice sheet that is currently contributing the most to sea level rise, and which has the potential to become unstable and contribute a lot more (3 meters!) to sea level rise in the future — has been warming up for the last 50 years or so. Our paper was met with a lot of skepticism, and not just from the usual suspects. A lot of our fellow scientists, it seems, had trouble getting over their long-held view (based only on absence of evidence) that the only place in Antarctica that was warming up was the Antarctica Peninsula. To be fair, our analysis was based on interpolation, using statistics to fill in data where it was absent, so we really hadn’t proven anything; we’d only done an analysis that pointed (strongly!) in a particular direction. It has been a strange couple of years in limbo: we have known with certainty for at least two years that our results were basically correct, because there was a great deal of very solid corroborating evidence, including the borehole temperature data that confirmed our basic findings, and data from automatic weather stations near the center of West Antarctica that we hadn’t used, but which Andy Monaghan at Ohio State (now NCAR) had shown also corroborated our results. But most of this work was unpublished until very recently, so it wasn’t really usable information. So it was a nice early Christmas present to see the publication of a new assessment by the well-known guru of Antarctic meteorology, David Bromwich, along with his students and colleagues at Ohio State, the University of Wisconsin (who run the U.S. automatic weather station program in Antarctica) and NCAR, which back up our results. Actually, they do more than back-up our results: they show that our estimates were too conservative and that West Antarctica is actually warming by about a factor of two more than we estimated. They also agree with the key interpretation of the results that both we and David Schneider and colleagues at NCAR have presented: that in the winter and spring seasons, when the most rapid warming is occurring in West Antarctica, the driver has been changes in the tropical Pacific, not the ozone hole (which is invoked too frequently, in my view, to explain everything from penguin populations to sea ice changes). The borehole temperature data were published earlier this year by Orsi et al. in Geophysical Research Letters. The new temperature reconstruction of Monaghan was included as part of a paper (Küttel et al.) on ice core records in Climate Dynamics, also earlier this year; it was also included in the reconstruction in Schneider et al. 2011 in Climate Dynamics. Both showed unambiguously that West Antarctic is warming up, as fast as the Antarctic Peninsula. Bromwich et al. gets this same result again. If it sounds like I don’t think Bromwich et al.’s results are anything new, let me correct that impression. The contribution of this new paper is huge. Bromwich et al. rely almost entirely on local data to produce the best-possible record of temperature from one location — Byrd Station in central West Antarctica. In contrast, our work relied heavily on interpolation of data from weather stations some distance from West Antarctica. Why didn’t we use the same data Bromwich et al. did? Well, we did, but the problem is that the Byrd Station record is actually several different records, taken at different times using different instruments. We felt that we could not splice these records together into one continous record, because instrument inter-calibration issues could easiily create spurious trends. One of the chief contributions of the Bromwich team is that they carefully checked the calibration on the various temperature sensors and dataloggers that are used in the Byrd automatic weather station. It turns out that there were significant calibration issues and that correcting for them makes the temperature higher in the 1990s but somewhat lower in the 2000s (though still higher than in the 1960 – 1980s). That is a compelling finding, because it puts the weather station data in better agreement with the climate forecast reanalysis data explaining the cause of the winter warming trends (as described e.g. in Ding et al., 2011; 2012). Another new aspect of the Bromwich et al. paper is that it shows that there is significant warming even in summer time in West Antarctica. This could arguably bode ill for the West Antarctic Ice Sheet, since if current trends continue it will mean more melting on the ice shelves there — ultimately leading to their collapse, as has already happened on the Antarctic Peninsula. As Anais Orsi and I discuss in a News & Views article — not yet online, but evidently to be in the Februrary print issue of Nature Geoscience [Update, Steig and Orsi is now online here]— Bromwich et al.’s results are objectively the best record available of the last five decades of temperature change in West Antarctica. Note that the while the borehole data are the most important independent validation, they provide only a smoothed look at past temperatures; they do not resolve interannual or decadal variability. Bromwich et al.’s updated record for Byrd Station should now be routinely incorporated into global temperature compilations such as those done by GISS and CRU. Doing so will, I think, change the picture of climate change in the Southern Hemisphere, and not insignificantly. There’s a lot more to be said — including some reasons why I don’t think the likelihood of surface-snow-melt-driven collapse of ice shelves is very high in West Antarctica — but I’m off to enjoy a respite from the internet for a few days. I’m going somewhere nice and cold and snowy. Reading materials, with links, below. UPDATE: Good article (in French) in Le Monde. Steig EJ & Orsi AJ. The heat is on in Antarctica. Nature Geoscience 6, 87–88 (2013). Bromwich, D. H. et al. Central West Antarctica among most rapidly warming regions on Earth, Nat. Geosci.(2012). Ding, Q., Steig, E. J., Battisti, D. S. & Kuttel, M. Winter warming in West Antarctica caused by central tropical Pacific warming. Nat. Geosci. 4, 398-403, doi:10.1038/ngeo1129 (2011). Ding, Q., Steig, E. J., Battisti, D. S. & Wallace, J. M. Influence of the tropics on the Southern Annular Mode. J. Climate 25, 6330-6348 doi:10.1175/JCLI-D-11-00523.1 (2012). Küttel, M., Steig, E. J., Ding, Q., Battisti, D. S. & Monaghan, A. J. Seasonal climate information preserved in West Antarctic ice core water isotopes: relationships to temperature, large-scale circulation, and sea ice. Clim. Dyn. 39, 1841-1857, doi:10.1007/s00382-012-1460-7 (2012). Orsi, A. J., Cornuelle, B. D. & Severinghaus, J. P. Little Ice Age cold interval in West Antarctica: Evidence from borehole temperature at the West Antarctic Ice Sheet (WAIS) Divide. Geophys. Res. Lett. 39, L09710, doi:10.1029/2012gl051260 (2012). Schneider, D. P., Deser, C. & Okumura, Y. An assessment and interpretation of the observed warming of West Antarctica in the austral spring. Clim. Dyn. 38, 323-347, doi:10.1007/s00382-010-0985-x (2011). Schneider, D. P. & Steig, E. J. Ice cores record significant 1940s Antarctic warmth related to tropical climate variability. Proceedings of the National Academy of Sciences 105, 12154-12158, doi:10.1073/pnas.0803627105 (2008). Steig, E. J., Ding, Q., Battisti, D. S. & Jenkins, A. Tropical forcing of Circumpolar Deep Water Inflow and outlet glacier thinning in the Amundsen Sea Embayment, West Antarctica. Annal. Glaciol. 53, 19-28, doi: 10.3189/2012AoG60A110 (2012). Steig, E.J., Schneider, D.P. Rutherford, S.D., Mann, M.E., Comiso, J.C., Shindell, D.T. Warming of the Antarctic ice-sheet surface since the 1957 International Geophysical Year. Nature 457, 459-462, doi:10.1038/nature07669 (2009). Antarctic’s Circumpolar temperature wave with 8 year period has a wave number of two, which would suggest that temperature in any particular (coastal) area would go up every four years. Any comment? The usual suspects are also experiencing something of a meltdown. Eric, do you mean “two more” (ie 1 + 2 = 3) or “two times” (ie 1 + 1 = 2)? I’m just trying to figure out if it’s twice as bad as you thought or three times as bad. Garry S_J: “Factor = a quantity by which a stated quantity is multiplied or divided, so as to indicate an increase or decrease in a measurement”. Russell, you never disappoint. But who is the redhead? And is there any news from Thwaites? 1.Thwaites? The luthier, the glacier, or the pork pie maker? Thanks for the article. I need such a reference often. #11–Well-said. Too bad they didn’t stick around to listen: “I note the absence of a quorum.” At least he’s on record. about Climate Science (as well as the politics) imho. THX I have already shared it with others. Trying to get a look at LarsenB but find that the latest modis etc pics are from 2009 can anyone point me to more recent sat observations. Thwaites Glacier has calved on major iceberg in 2012 and the embayment on the west side of the main tongue is continuing to expand in the last month. An interesting remaining question is what failed in O’Donnell et al? [Response: Well, as I explained here, they would have gotten a better answer had those chosen any other parameter for a particular part of their routine than they did. I pointed this out in my review, but those chose to ignore it. I make no comment as to why. I misspoke. Does anyone know what’s happening with the Thwaites glacier? Last I saw anything, the crack was nearly complete. It’s interesting, most people outside the field are unaware of how difficult these observations are to make/collect. This frees them to snipe at the inexactitude rather than heed the warnings. 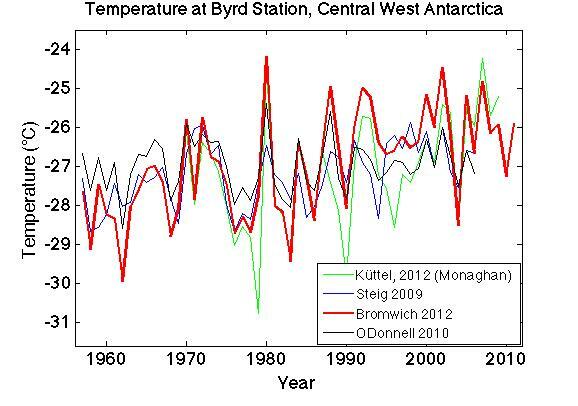 Both the Antarctic peninsula and the WAIS have apparently undergone marked warming during the last 50 years. However the WAIS and Antarctic annual temperatures show negligible correlation. That seems somewhat anti-intuitive to me. In my mind the correlation coefficient would be determined by plotting each annual temperature of WAIS against each corresponding annual temperature of the peninsula. Presumably they were both relatively lowish 50 years ago and relatively warmish now and somewhat intermediate at intermediate years. So is the absence of correlation due to the large standard deviations in the temperature data? Or is the correlation determined in some other way? Or do annual temperatures tend to go up in the peninsula when they tend to go down on the WAIS? or what…? On the local level, variability is still much larger than the warming trend. Here are more complete maps of temperature correlation to Byrd. There are still huge areas of negative correlation. It’s not very different on the northern hemisphere, where the trend is up almost everywhere. The maps show mostly weather; patterns that persist over several months are more likely to be climate. Data are from NCEP reanalysis 2, including the reference values near Byrd where the trend is about .1 K/a in R2. Thanks eric and Andreas for your clarifications. Cenozoic temperature, sea level and CO2 co-variations provide insights into climate sensitivity to external forcings and sea level sensitivity to climate change. Pleistocene climate oscillations imply a fast-feedback climate sensitivity 3 ± 1°C for 4 W/m2 CO2 forcing for the average of climate states between the Holocene and Last Glacial Maximum (LGM), the error estimate being large and partly subjective because of continuing uncertainty about LGM global surface climate. Slow feedbacks, especially change of ice sheet size and atmospheric CO2, amplify total Earth system sensitivity. Ice sheet response time is poorly defined, but we suggest that hysteresis and slow response in current ice sheet models are exaggerated. We use a global model, simplified to essential processes, to investigate state-dependence of climate sensitivity, finding a strong increase in sensitivity when global temperature reaches early Cenozoic and higher levels, as increased water vapor eliminates the tropopause. It follows that burning all fossil fuels would create a different planet, one on which humans would find it difficult to survive. A very nice comparison of recent work, but I note that, just as the global temps have been in a stillstand for nearly a decade, so it is with the West Antarctica–no significant rise since 2,000 or so. “… with the color coding according to the phase of ENSO, the eye is able to compare apples to apples: the upward long-term trend during El Niño years (red triangles) is plain, the upward long-term trend during neutral years (green squares) is plain, and the upward long-term trend during La Niña years (blue diamonds) is plain. —- a bit tangential but I thought the use of the graphics helped. Polar amplification is a testable prediction rooted in the basic physics of AGW theory, and is particularly important because it can be validated or refuted in the reasonably near term. Storminess increases can of course also be related to AGW, but how can the effect of the increase in storms be teased from the true physics-based polar amplification of warming in Antarctica in order to independently evaluate the prediction of polar amplification? So twice per generation we’re turning what was a typical warm month into a typical cool one. I see grandparents telling tales of snowdrifts to children who’ve never seen a flake. What is happening in East Antarctica; two thirds of the continent? Saw this paper on the day of return from AA peninsula. Can anyone explain why the AA sea ice extent was apparently so great this year? They also report a great deal of snow fall, which I understand. Thanks. “… Since 1980 …. loss of ozone caused atmospheric pressure to decrease over the Amundsen Sea, thereby strengthening the winds on the Ross Ice Shelf, according to NASA Goddard scientist Josefino Comiso, coauthor of a recent study that models the connection between ozone, wind speeds, and climate in the Antarctic. The changes help explain one of the paradoxes of the Antarctic: while sea ice in some areas is growing rapidly, it’s retreating at a rapid pace in others. The new model suggests that colder, stormier, and faster winds are rushing over the waters encircling Antarctic — especially the Ross Sea, where ice growth has been the most rapid. The winds create areas of open water near the coast – known as polynyas – that promote sea ice production. I see the GISS temperature record has been changed upwards for several years. Does this mean Byrd station data is already included?